Model walks in orange designer embroidery shimmer faux georgette saree with sequins buttes and embroidered border work paired with designer embroidered short sleeves saree blouse from designer Bhairavi Jaikishan at Bridal Asia 2011. Model displaying green designer embroidery shimmer saree with embellished patch and lace border work paired with designer embroidered short sleeves saree blouse from designer Bhairavi Jaikishan at Bridal Asia 2011. Model walks in pink designer embroidery shimmer faux georgette bridal saree with sequins buttes,studs,patch and silver lace border paired with designer embroidered saree blouse from designer Bhairavi Jaikishan at Bridal Asia 2011. Model walks in re red designer embroidery shimmer faux georgette saree with gold lace border,printed and patch work paired with designer sleeveless saree blouse with ‘V’ shape neck pattern from designer Bhairavi Jaikishan at Bridal Asia 2011. Model walks in red designer embroidery lehenga style saree with printed and gold border work paired with designer saree blouse from designer Pallavi Jaikishan at Bridal Asia 2011.It is a shimmer saree. Model walks in pink designer embroidery bridal saree with sequins buttes and embroidered border work paired with designer embroidered cap sleeves saree blouse from designer Pallavi Jaikishan at Bridal Asia 2011. Model displaying beautiful red designer embroidery bridal saree with gold embroidered border ,patch work paired with designer embroidered saree blouse from designer Pallavi Jaikishan at Bridal Asia 2011. Model walks in black and tan designer embroidery shimmer saree with embroidered lace border paired with designer embroidered full sleeves saree blouse from designer Sabyasachi at Bridal Asia 2011. Model displaying green designer embroidery shimmer saree with sequins buttes and silver lace border work paired with designer embroidered full sleeves saree blouse from designer Sabyasachi at Bridal Asia 2011. Models displaying designer Sabyasachi bridal collection 2011 at Bridal Asia 2011. Bollywood celebrity Seema Puri in beautiful green and pink designer bridal saree drape with heavy embroidered,embellished gold,sequins buttes,studs and designer border work paired with designer short sleeves saree blouse with open neck pattern from designer Nidhi Tholia at Bridal Asia Party at Second Sin. Bollywood celebrity Gunita Dhingra in beautiful cream designer embroidery shimmer faux georgette saree drape with gold embellished,sequins buttes and red and green designer double border work paired with designer embroidered quarter sleeves saree blouse with ‘V’ shape collared neck pattern from designer Nidhi Tholia at Bridal Asia Party at Second Sin. Bollywood actress in beautiful designer embroidery bridal saree. Border is decorated with sequins buttes and studs gold embroidered border and mirror work paired with designer short sleeves saree blouse. Check out Sneha reddy in orange designer traditional silk saree at their wedding reception . The saree is in pure zari and has self work on it. It is paired with designer cap sleeves saree blouse. Models displaying designer Pallavi Jaikishan’s collection at Bridal Asia. Model displaying designer Rina Dhaka's Creation during Bridal Asia 2009. 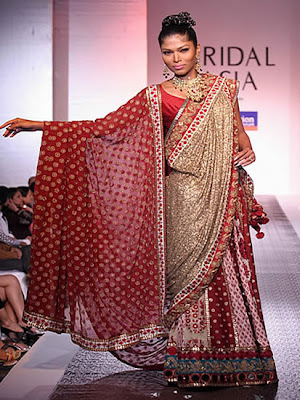 Check out beautiful designer saree form Rina Dhaka in Bridal Asia . Check out gorgeous white designer bridal saree from Bhairavi Jaikrishna in Bridal Asia. 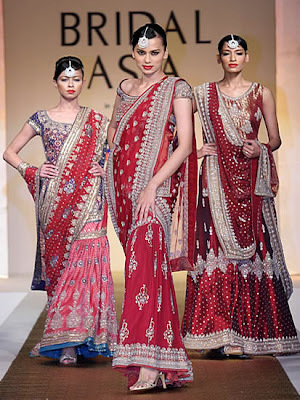 Check out collection of bridal sarees in Bridal Asia 2008 fashion show. Designers Rina Dhaka, Malini Ramani, Varun Bahl, Pallavi Jaikishan, Sabyasachi Mukherjee , Bhairavi Jaikishan presented their bridal trends for the season at Bridal Asia fashion show.